In the beginning of the narrative, Nephi, a young man of unknown age is living peaceably in the city of Jerusalem and just a short time later, he stands before the drunken body of Laban as the Lord commands him to slay the man; what a contrast of situations for anyone to be placed in! So when the topic came up in class, I wanted to shed some light on the issue, but seeing as how the teacher was seeking to cover a heavy load of information with little time to do it in, I refrained from going deeper in to the topic as there were more important matters that he was trying to cover. Since the topic has been on my mind, I figured it would make for an interesting article here at oneClimbs, so here we go. Many people are familiar with the 10 Commandments, especially “Thou shalt not kill” (Exodus 20:13) or “murder” as it is more properly rendered. But most people, I think, are not quite up to speed on the entire law that the God gave the Israelites. Even though, God commanded men not to kill, we must realize that He also commanded that certain acts were, in fact, worthy of execution. Key to understanding why Nephi was justified in slaying Laban is the understanding of the crimes that Laban himself committed in context of the law at the time. It is understandable that Laban might value the records and desire to not just give them away, but in his anger he violates the law by accusing Laman of robbery (an act of violent theft that will be further defined later) when Laman had not robbed or expressed any intention to rob, but then seeks to falsely enforce the law by attempting to murder Laman. If you falsely accused someone of a crime, then the your penalty was to receive the punishment that you had intended to bring on the person you had falsely accused. Laban had falsely accused Laman of being a robber and the penalty for robbery was death. If he beget a son that is a robber, a shedder of blood, and that doeth the like to any one of these things, And that doeth not any of those duties, but even hath eaten upon the mountains, and defiled his neighbour’s wife, Hath oppressed the poor and needy, hath spoiled by violence, hath not restored the pledge, and hath lifted up his eyes to the idols, hath committed abomination, Hath given forth upon usury, and hath taken increase: shall he then live? he shall not live: he hath done all these abominations; he shall surely die; his blood shall be upon him. (Ezekiel 18:10-13). Although there is only little difference between a thief and a robber in most modern minds, there were considerable differences between the two under ancient Near Eastern law. A thief (ganab) was usually a local person who stole from his neighbor. He was dealt with judicially. He was tried and punished civilly, most often by a court composed of his fellow townspeople. A robber, on the other hand, was treated as an outsider, as a brigand or highwayman. He was dealt with militarily, and he could be executed summarily. Laman in simply asking Laban for the plates was not attempting robbery. The brass plates were stored away in a treasury (1 Nephi 4:20) so it would have been impossible for Laman to forcibly take them from Laban if they were not even in his possession. After fleeing from the presence of Laban, Laman returns to his brothers who are saddened to learn of Laban’s reaction. It is reasonable to assume that the brothers decide to give Laban the benefit of the doubt and realize that it probably sounded a bit fishy for them to just appear and request that Laban simply give away property that would have more than likely been valuable to him. But they have been commanded to obtain the plates so Nephi suggests that they take all of their gold, silver and precious things, basically their entire inheritance and purchase the plates from Laban. It is at this point where Laban seals his own fate by actually committing the act he had just accused Laman of earlier that evening: robbery. Laban covets (also against the ten commandments) the property of Nephi and his brothers and turns from being a military leader to the leader of a band of robbers by forcibly taking their property and then seeking to kill them under false pretenses. Had Laban been taken to court by Nephi and his brothers, he would most likely have been convicted and been put to death for robbery, among other things, since Nephi and he four brothers met the requirements for the law of witnesses which required at least two or three. But there was no time to pursue a trial and judging by the corruption in Jerusalem at the time and the fact that a law man had been the one committing the crime, he may have ended up getting off scott-free possibly due to his connections. The crime of attempted murder by Laban was committed not once, but twice. First, Laban seeks to kill Laman with his own hands: “Wherefore, he said unto [Laman]: Behold thou art a robber, and I will slay thee” (1 Nephi 3:13). Next, he instructs his servants to unlawfully execute Nephi, Laman and their brothers Lemuel and Sam. This would have been a multiple homicide that Laban himself would have been responsible for. It may be only speculation, but the way that Laman so nonchalantly throws around false accusations and attempts murder seems to indicate that this man might have a much darker history filled with other acts of violence, robbery and murder that we are not aware of but that further justified Nephi in bringing justice to not only him and his brothers, but possibly others who never saw justice. Nephi makes the decision to return yet again to try and obtain the plates, only this time, he doesn’t have a plan; he goes forth “led by the Spirit, not knowing beforehand the things which I should do” (1 Nephi 4:6). He finds Laban drunk, lying in an alley, most likely the result of celebrating in his illegally acquired wealth. It is then that the Spirit of the Lord commands Nephi to slay Laban. Nephi recoils at the idea, “Never at any time have I shed the blood of man. And I shrunk and would that I might not slay him” (1 Nephi 4:10). 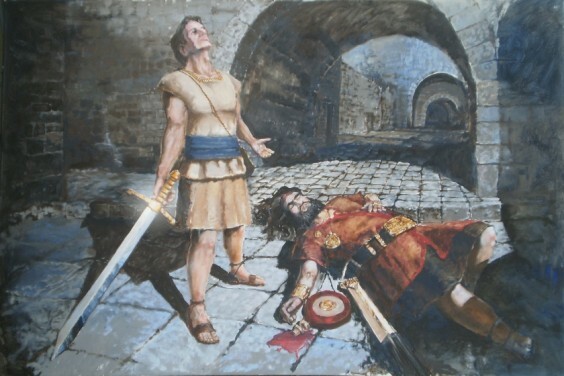 Nephi does not want to carry out the act of killing Laban but the Spirt of the Lord commands Nephi once again to slay Laban and this time, after recounting his crimes of attempted murder and robbery, Nephi obeys the Lord and beheads Laban with his own sword (1 Nephi 4:18). The most important thing to understand in this account is that Laban committed three grievous offenses, false accusation, robbery and attempted murder and received an appropriate punishment for his crimes according to the Law of Moses. The only difficult thing for us to come to terms with is the individual who was used to carry out the sentence. I tend to think of Nephi as being in the same situation as young David when he justly slew and also beheaded Goliath of Gath. In both cases, David and Nephi were carrying out God’s justice and had his authority to do so. Case closed. Why not have I lion eat him. Why make his servant break His own commandment. Especally one who is to become a Prophet. If God tells you to kill me, please don’t. Robert, not everything in scripture is smooth and fits in our paradigms of what we think reality should be like. This is very challenging for each of us who read these things so far removed from the time and full details of what happened. Like you, I could think of a number of other ways that the Nephi/Laban situation could have been resolved. The point is that Nephi and his brothers sought peaceful means to obtain the plates and Laban responded by robbing and trying to murder them. Under Mosaic law, Laban committed at least three crimes that would have earned him the death penalty. As the government was corrupt as well as the church, justice would have not been served according to the law God delivered to Moses. This incident and why it is recorded I scripture is meant to illustrate a larger pattern of blessing and cursing much like the Daniel/Goliath account. I encourage you to study and do some more background research. I’m not sure that you read the article very carefully, because I very carefully laid out he case but it is only one facet of what is going on here. You are welcome to explore and learn with us. Wanted — Nephi, son of Lehi the deranged right wing extremist, for the ritual beheading style execution of prominent citizen Laban. At that point in their society, Nephi had done Laban a favor and spared him the execution he awaited a few years later at the hands of the Babylonians. Second, the issue of Zoram. Some scholars argue that Zoram was kin to Laban and held against his will, in violation of the law, and that is why he had access to the sacred records but was so easily convinced to follow Nephi. Yeah, you’re probably right. The media tends to convict people before they’ve had their day in court. If the government was righteous and functioned well, then Nephi and his brothers easily would have constituted the minimum of three witnesses to convict someone of a crime (there were four of them). I think the fact that Nephi was told to kill Laban (a military/government figure) was an illustration of how corrupt the people of Jerusalem and their government were; there was no way to appeal for justice. Power figures could rob and kill with no repercussions. Laban was microcosm of larger, widespread wickedness and corruption. The fall of the drunken Laban portended the fall of an Israel drunken in wickedness. Laban’s sword could have represented the Babylonians. That Zoram theory is an interesting one, I think it’s entirely possible but it is difficult to know for sure. It seems though that Zoram was a more righteous man as he was almost considered part of the family and he married one of Ishmael’s daughters. He was probably a witness to Laban’s and possibly “the Elders” corruption and when he saw a way out, he took it. He had access to the brass plates and might have read them and believed the words of the prophets. He might have heard the words of the many prophets in the streets and could have been very aware that the collapse of the society was imminent. There are a lot of ways to look at these things which makes them great for continual study.